Can’t make it to the Aquarium? Loved your visit and want to extend the fun? The beach is within reach through the North Carolina Aquarium at Fort Fisher’s Outreach program. Let our education staff bring one of our fun, interactive programs to your classroom, group, or event. Outreach pricing depends on several factors including travel, staffing, and special requests. Final pricing will be determined after we receive your request form. Click here for the Outreach Program request form. Participants make Eric Carle’s A House for Hermit Crab come to life with costumes, hand motions, and a tinge of acting. After helping hermit crab find his new home, participants meet the real animals from the story. We learn about the interesting characteristics of hermit crabs, sea stars, sea urchins, and sea snails by getting up close and personal with these live animals. Join us as we learn about one of the oldest animals living on our planet today and find out how horseshoe crabs are important to us. After reading Crab Moon by Ruth Horowitz, participants will explore how horseshoe crabs move, see, and eat though exciting activities, props, and a live horseshoe crab! All animals speak - just in different ways. Discover the hidden world of some of North Carolina’s marine invertebrates in this live animal presentation. Participants will fine-tune their observation skills while exploring snails, crabs, sea stars, urchins, and other sea creatures. Take a closer look at treasures we find on North Carolina’s beaches. Educators bring a sampling of the marine invertebrates that make many of our beautiful shells. Next time you take a stroll on the beach, teach your companions all about the mermaid’s purses, shark teeth, seashells, and sand dollars you find! Meet the seahorse, a fish unlike another other! Participants learn about these and some other amazing fish through the reading and dramatization of Eric Carle’s Mr. Seahorse. After acting out the story, participants meet some live seahorses and find out what we can do to help these amazing animals! Take a virtual journey into the ocean and discover what dolphins, whales and humans have in common. Interactive props and engaging activities bring participants close to these amazing marine mammals without actually getting wet! What do sharks, seahorses, and flounder have in common? They’re all fish! Fish come in a variety of shapes and sizes. 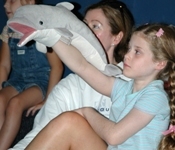 Join us as we learn the characteristics of fish and uncover some of the facts and fictions of these fantastic animals through interactive activities, props, and a live seahorse. Do you know what ocean animal is famous for its sting? Join us as we learn about one of the most numerous animals in our oceans and find out about the important role they play in their ocean habitat. Participants will explore the jelly life cycle through interactive activities and props, and even get up close with live jellies! Is a turtle shell its home? Help us answer this age old question as we examine the lives of North Carolina’s land, freshwater and sea turtles. Learn about turtle behavior, feeding habits, anatomy, and find out what you can do to help protect these fascinating reptiles. Program includes live animals. Looking for a Sea Turtle Program? You found it! We frequently present a modified version of “Turtle Time” which focuses on the lives of Sea Turtles, but still incorporates live turtles, though unfortunately we are not able to bring live sea turtles. Are they fish? Reptiles? What group of animals do these slimy critters belong to? Even though frogs, toads and salamanders are common residents of many local neighborhoods, most people know very little about them. Our live amphibians and activities will definitely leave you croaking for more! What if your best friend had slimy skin and started life as a tadpole? Begin your exploration of amphibians with The Salamander Room, by Anne Mazer. Then meet the star of the story, and their hopping relatives, the frogs and toads. Interactive and engaging activities help participants explore the unique lives of our amphibian neighbors. Reptiles have been around since dinosaurs walked the earth, and some of them have changed very little! Meet a few of these fascinating creatures and learn how they have adapted to survive so successfully. Hundreds of amazing plants and animals can be found in freshwater wetlands throughout North America. After a reading of Deep in the Swamp, by Donna M. Bateman, we will meet some of our North Carolina wetland inhabitants from the story and find out why it is so important to protect this unique habitat. Program does include live wetland animals. Get to know an ancient North Carolina native in this interactive live animal program on the American Alligator. You’ll be amazed as you learn about the numerous adaptations helping these giants survive. Join the Aquarium as we delve into ocean acidification, its causes, and its effects on many of the animals who call the ocean home. Students participate in lab demonstrations and interactive activities to learn why the ocean is becoming more acidic. They also meet many of the animals who will be impacted by this change in their environment. A sea urchin who loves to play dress-up? A turtle with a snorkel for a nose? Meet North Carolina natives whose costumes and acting skills help them survive in the wild. Let these freaky and sometimes creepy friends help you get ready for the spookiest night of the year. 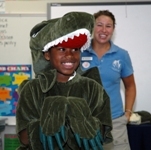 Give the gift of education by sponsoring the Fort Fisher Aquarium outreach to visit your child’s classroom as a birthday gift or for any other special occasion. We’ll present a classroom animal program, but it will be sponsored by you as a gift to the entire class! Choose from a variety of topics to reflect the interests of your child and be sure to check with your child’s teacher before scheduling a date. Bring the wilderness into your classroom while teaching your students about the specific needs of a variety of animals. Program includes group activities allowing for exploration of the needs of animals, followed by an opportunity to meet the animals they explored. Tadpole to toad, planula to medusa, hatchling to alligator! There are a multitude of life cycles happening around the Aquarium! We will share the life cycles of several Aquarium animals with your students and provide interactive activities and a chance to meet the animals up close. Take a simulated journey down the Cape Fear River; learning about the many ecosystems it connects within our state. Enjoy the opportunity to meet a live ambassador from each of these ecosystems and explore their role within the ecosystem. Where are the cures for cancer, Alzheimer’s disease and the common cold? In the ocean! Explore different medicines and the ocean animals that they come from, including meeting live examples of these animals. Your students will be fascinated to learn about the importance of maintaining ocean biodiversity in order to develop new medicines. Have the North Carolina Aquarium at Fort Fisher come to your festival or fair. Participants will enjoy getting their picture taken with our giant inflatable spadefish or enjoy interacting with Aquarium educators. Interactive games, costumes, live animals and props introduce visitors to North Carolina’s natural world. Topics depend on your interests: sharks, reptiles, whales and dolphins, turtles, marine invertebrates- the possibilities are endless!